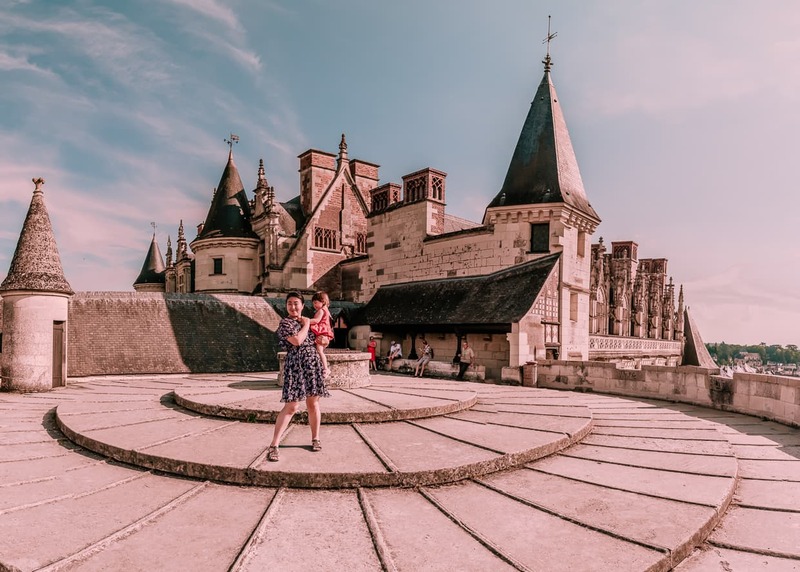 We gave ourselves a whole week to photograph the Loire Valley, nicknamed the “Valley of Kings” for the many Chateaux that are built along the banks of the beautiful Loire River. Our stay fell in late June, in the middle of our month road-tripping through France. 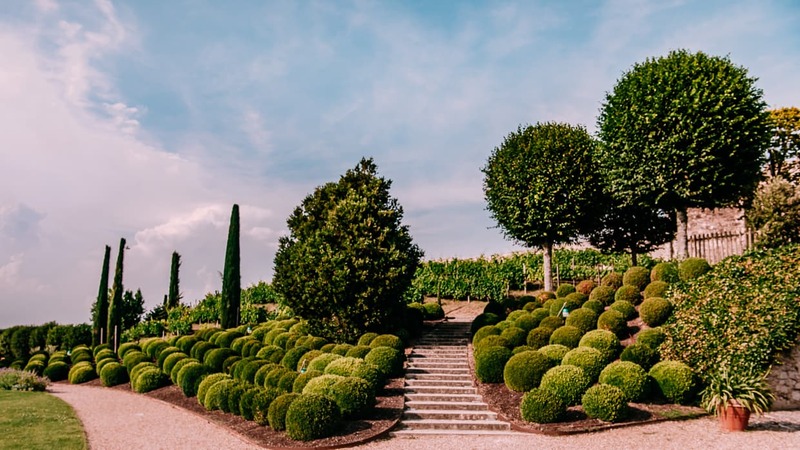 We had just finished two weeks in Provence, and we wanted to strike the right balance between capturing more photos of iconic French countryside, and getting in a bit more relaxation before heading back to busy Paris. 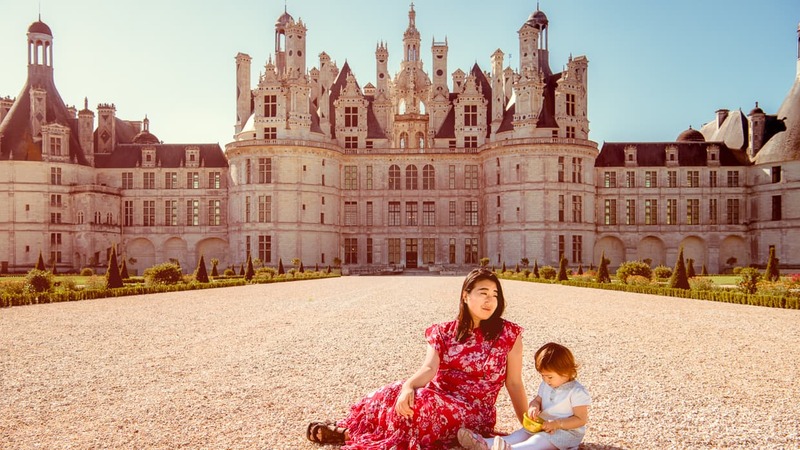 What is the Loire Valley? 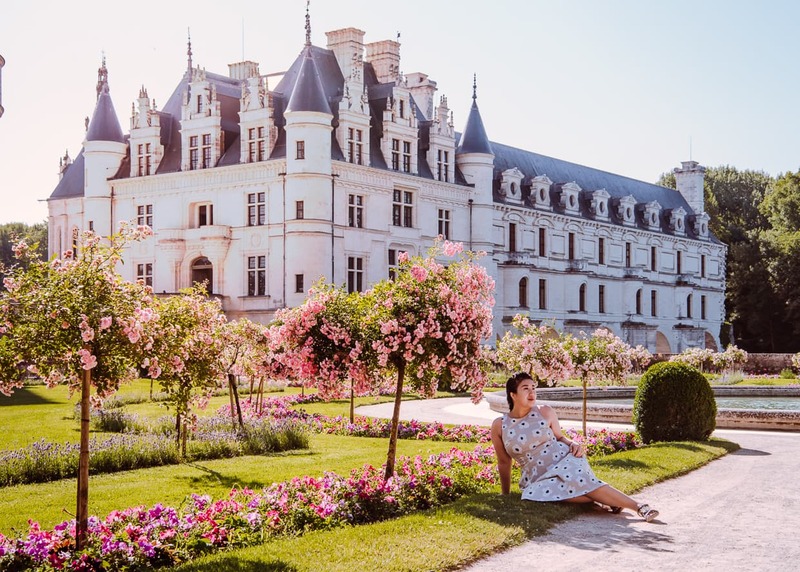 The Loire Valley is a section of the Loire River that is known for its pleasant climate, plentiful vineyards, fertile soil, and (for the purposes of this article) highly photogenic châteaux. 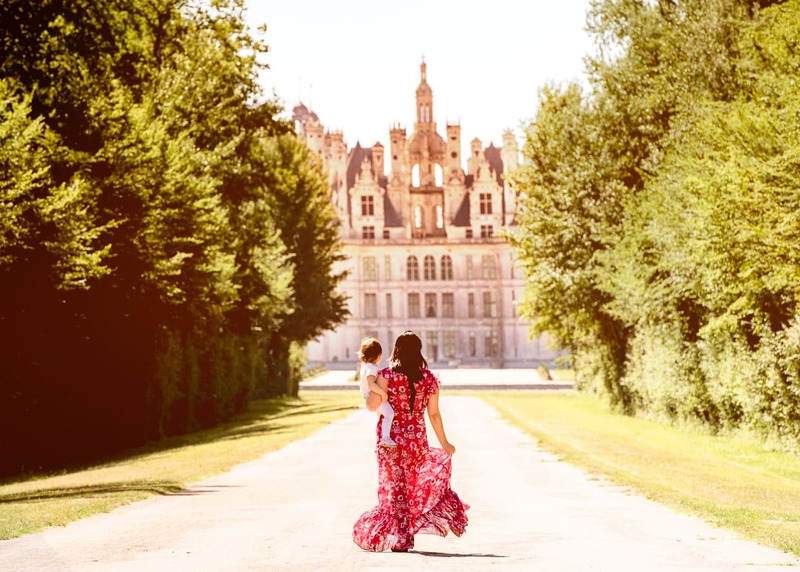 The Loire is home to over 300 châteaux, and has been designated a UNESCO World Heritage Site. The 800 square kilometer region that surrounds the middle section of the river is in central France, a few hours southeast of Paris. I was going to include a definition of the word “château” (plural châteaux) but it turns out that’s a trickier task than I’d care to tackle. “Chateau” has a different meaning in French than it does in English, and it has evolved over time. You could go read the wikipedia page for “château” and get a headache, or you could just accept that for photographers visiting the Loire Valley, a château is a very pretty building in the countryside that often cosmetically resembles a castle but isn’t intended as a real fortification. Of course we didn’t visit every château in the week that we stayed in Amboise. We took it pretty slow, and after a little research, we picked five that we thought we’d really enjoy. We took a lot of photos and we even returned to one or two of the châtaux that we thought deserved better lighting. 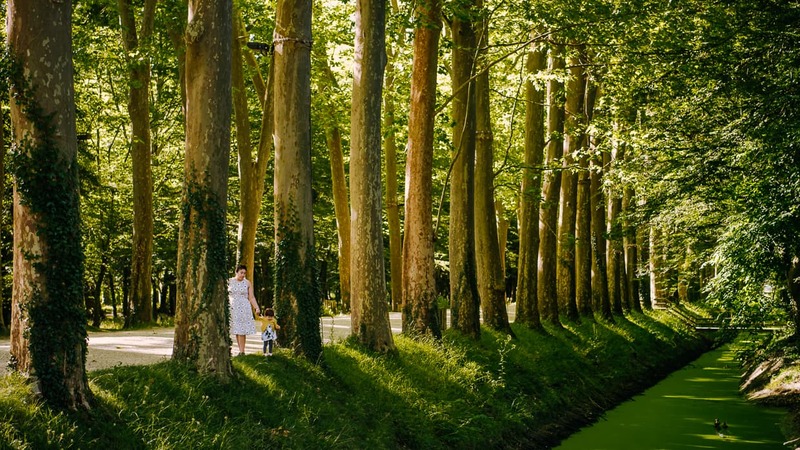 Here are our tips for getting the most out of the Loire Valley, photographically. Long before our trip to france, we were thinking about trying to get by without a car. We looked into trains, buses and tours, but eventually decided that a road trip through France was the only way to make things work. Nothing we wanted to see had good public transportation, and we’ve never liked being in a tour group. We wanted to be able to head out at the crack of dawn and move at our own pace. Only driving our own car would allow us to do that. Dannie and I were a little worried about the prospect of driving in another country, especially one where we don’t speak the language. But as it turned out, driving in France was pretty much the same as driving in the United States. The biggest differences were actually all positive. Rest areas are everywhere on the highways and the roads are well maintained. There are some tolls, but you get what you pay for. The language wasn’t as big of a problem as I had feared. Most of the time I was able to figure out what a sign was saying. The most important signs had arrows or even pictures on them, and for some reason, stop signs in France say “STOP” in English. I can’t imagine how different our week in the Loire Valley would have been without a car. We would have had to hire a ride or take a bus for every castle we visited, and we wouldn’t have had control over our schedule or our photography. Plus, driving along the sleepy banks of the Loire was beautiful and soothing. We rented our car at the Charles De Gaulle airport in Paris and returned it after completing our loop through the South of France. 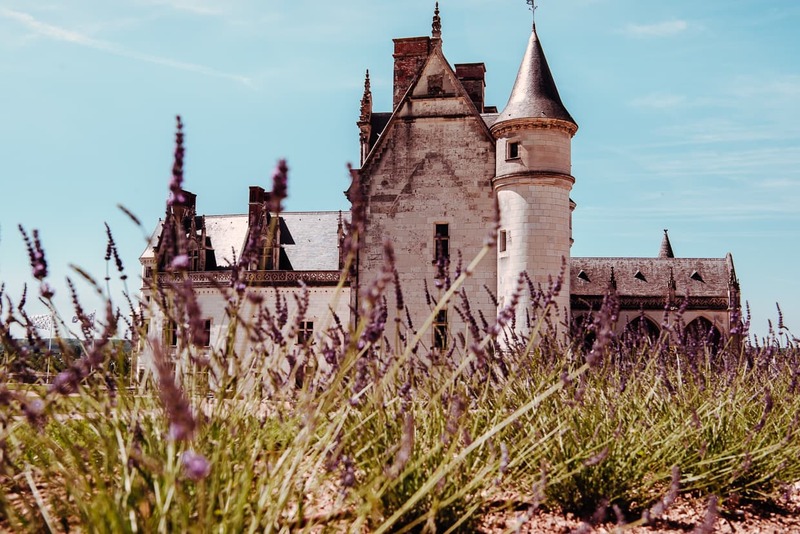 Before you go out and explore the Loire Valley, make sure you have everything you’ll need to have a productive and enjoyable experience. 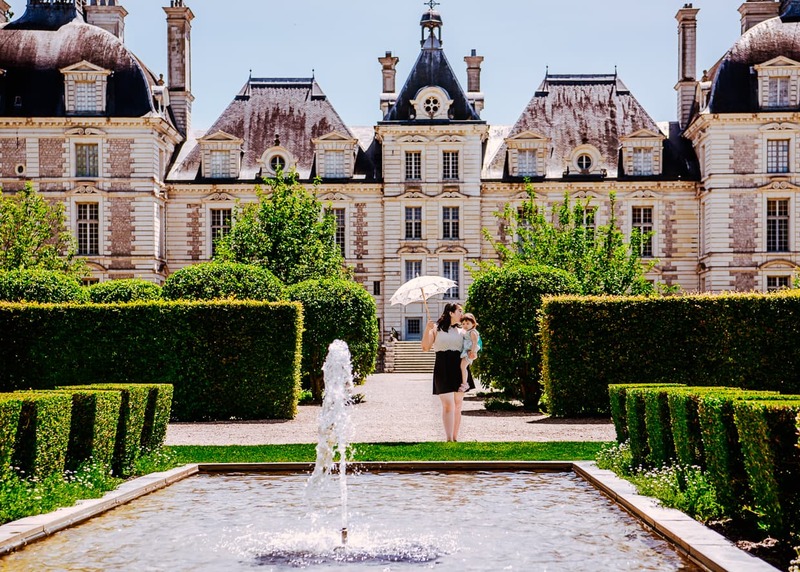 Food at the châteaux is limited and expensive, so bring a lunch or some snacks. Water is a must. the region is hot in the Summer, and our visit fell in the middle of a record heat wave. Also, those beautiful estates weren’t necessarily designed with shade in mind, so don’t forget to apply and reapply sunblock. Strollers for children are of questionable value. The French seem to like dusty, gravelly dirt roads in their parks and estates (even in Paris), and the insides of the château tend to have a lot of stairs. You might be better off with a baby carrier like the Ergobaby that we use (read our review). Of course the upside of a stroller is that it can provide shade from the sun, even if it is a little tough to push around, so follow your instincts on that one. As for photography gear, we always bring our 24-70mm and 70-200mm lenses. French châteaux are big buildings, so wide angles tend to come in handy. But I’ve always had a thing for the long lenses. I like to zoom in on details and compress distances for portraits of my family. A telephoto or zoom lens will really let you get some creative shots that will stand out from the standard tourist pics. I’ve actually written an entire article about getting creative travel photography using a zoom lens, if you’re interested. And of course, you’re going to want to know how to put that expensive gear to good use. 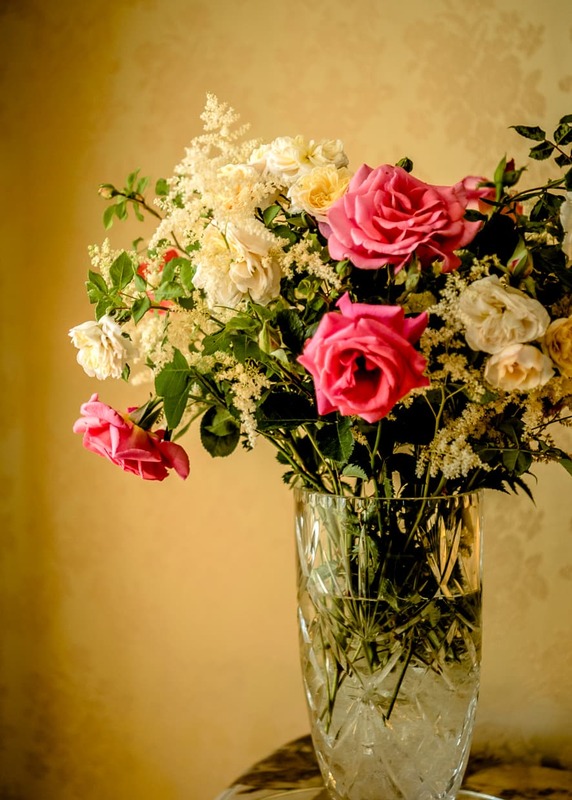 You can do that inexpensively with my new E-book, Easy Manual Mode Photography, which will help you take the luck out of your photography and seize creative control of any photographic situation. As for your tripod and lighting equipment, leave them at home (unless you have paid for a photography permit and special access). Bulky and intrusive photography gear is generally forbidden, and you will probably be barred from bringing it inside. For a more complete list of the gear we use, visit our resource page. 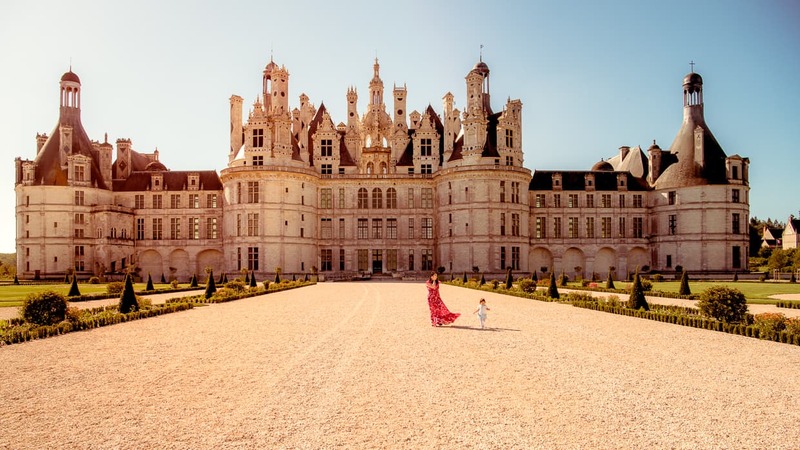 The Château de Chambord is the largest château in the Loire Valley. It was never completed, but it was originally intended for use as a hunting lodge. Completed or not, the entire site has been restored and well maintained after a long period of abandonment after the French Revolution. If you are visiting for photography, make sure you show up right at opening time, especially during the high season. We were there in mid June, and the crowds were always nipping at our heels. For hours and prices, visit the link above. 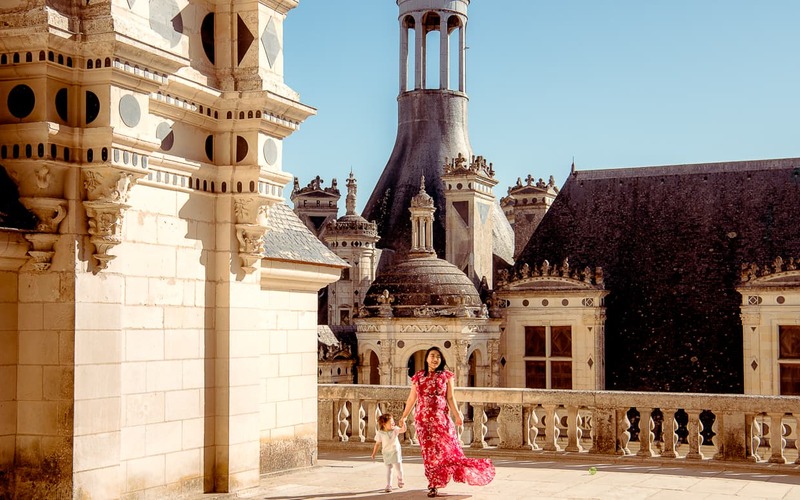 We visited Chambord twice – once to scout the grounds and enjoy the exhibits, and a second time to take all the photos we planned out while scouting. Here are some of our favorite angles. 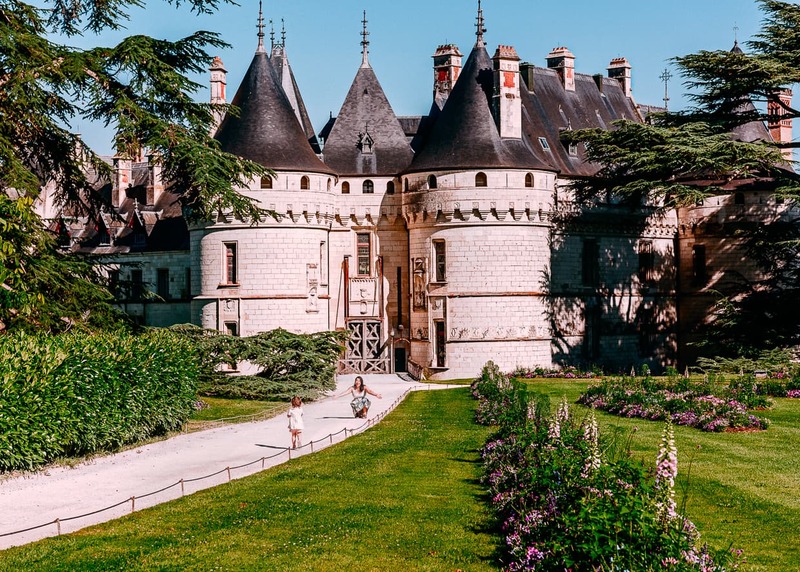 1: Photograph the Chateau from the Gardens: As you are entering the castle grounds, after buying your ticket, you will pass by the gardens, but you will not be able to reach them because of the moat. 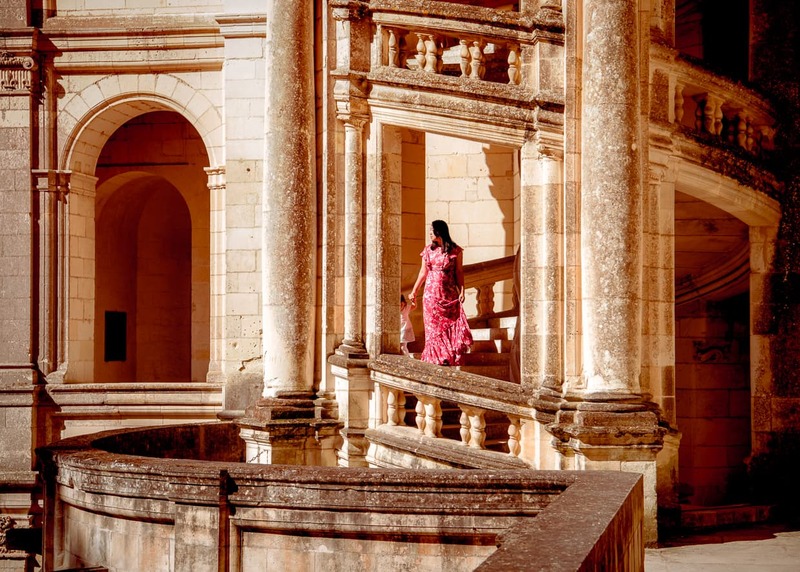 To get there, you will have to pass through the main hall of the Château and out the back. After scouting, we decided to head to the gardens first because it was our widest shot, and therefore the hardest to compose without other tourists. Also, because this photo would have the least shade to work with, we wanted to get it before the sun got too high in the sky. 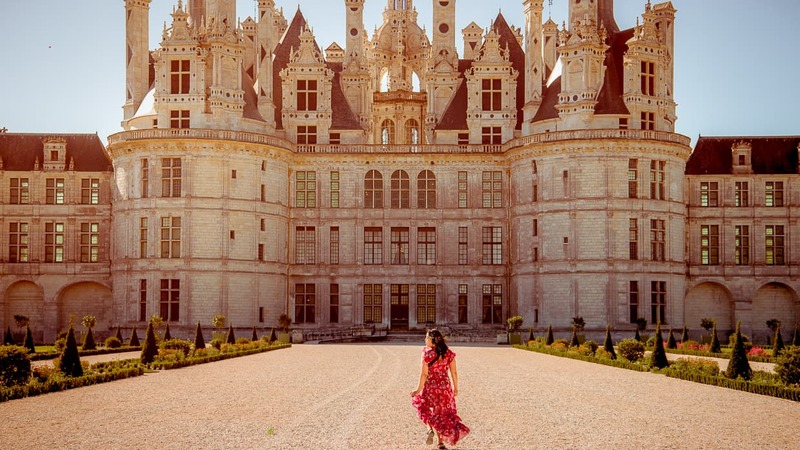 If you want to see the Chateau de Chambord without tourists, you have to get there early. 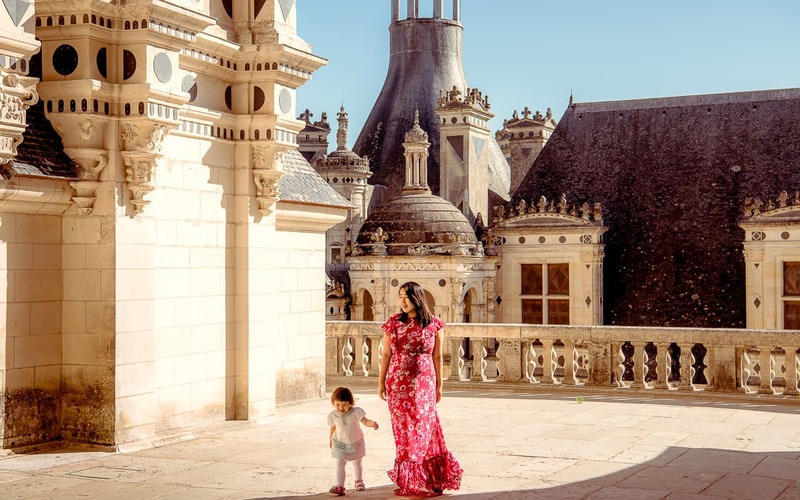 2: Photograph the Gardens from the Chateau: If you climb to the rooftop of the Château de Chambord, you will get a stunning view of the gardens and the surrounding countryside. 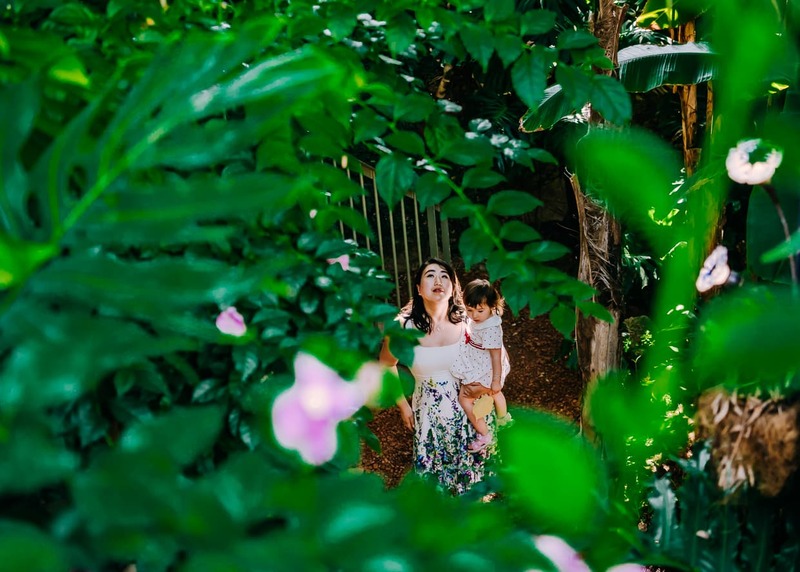 If you are interested in family photos, it’s also possible to use one of the many balconies to compose a shot of your subjects looking out over the flowers and trees below. 3: The Rooftop Towers and Chimneys: While you are on the rooftop, you will be surrounded by what looks like a small city of white stone and shimmering glass. 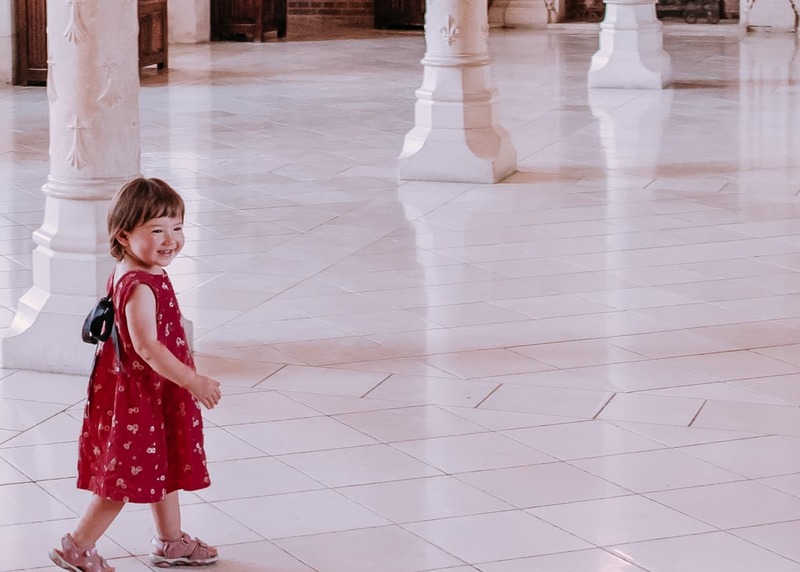 It’s a fun place to get a few shots of the kids exploring, or just to capture the amazing architecture. Our favorite location on the rooftop was the peak of the main staircase that rose up into a glass encased steeple in the center of the building. We thought the rooftop of the Chateau de chambered looked even better up close. 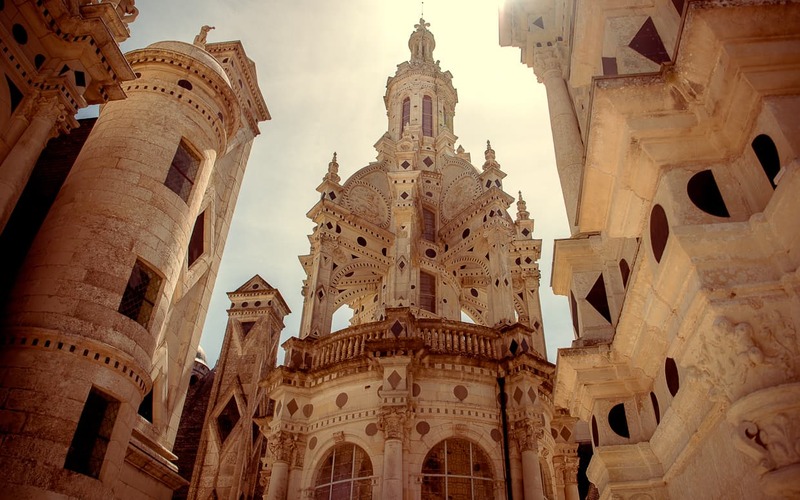 4: The Interior and Exterior Staircases: I didn’t count the staircases in Chambord, but they are numerous and grand enough that they become a central theme of the architecture. Some of them are outside, and can be accessed from the courtyard, though by the time we got to them, we found that the lighting was unattractively harsh. I think they would have looked better on a cloudy day when the highlights and shadows wouldn’t have hidden Dannie and Lisa so well. The central staircase inside the main hall is a wonder. It’s a grand double spiral that goes all the way from the ground to the roof. I would have liked to use some lighting equipment inside, but all the guards hanging around didn’t make the scene feel very conducive to a big production. 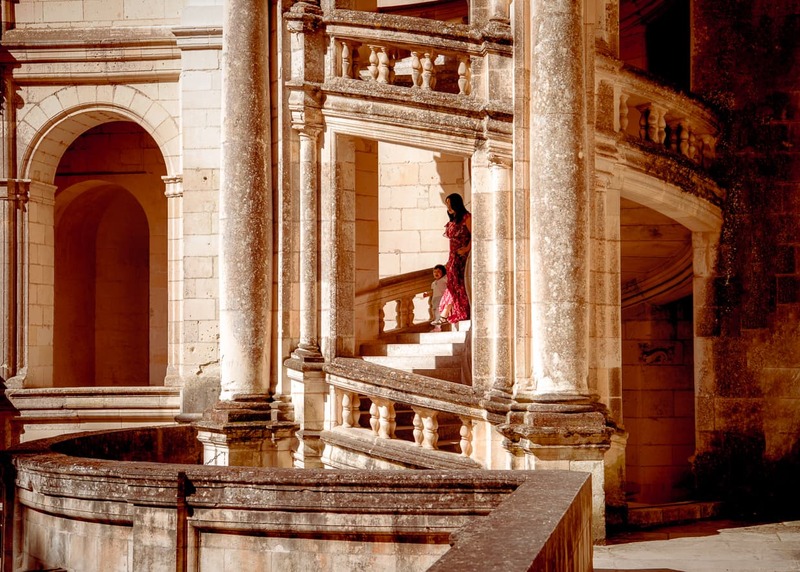 These stairs on the outside of Chambord look like something out of Game of Thrones. 5: The Castle Grounds: On the side of the Château opposite the garden there are… more gardens. A few paths wrap around some open grass, lined with rows of planted trees. It’s not quite as magnificent as Chambord itself, but the trees provide some shade for a stroll. Bonus Angle: From the Road Near the Roundabout: On our first trip to Chambord we drove through a roundabout by a path that cut through the forest, revealing the gardens and château in the background. After taking our photos the second day, we decided to pull over a few meters away from the path and do one last quick shoot before moving on. The nice thing about this spot is that there are no crowds because there is no parking, and no entrance fee because it is outside the estate. The downside is that you can’t really relax there because there isn’t much shoulder on the side of the road, and you aren’t sure if you are parked illegally or not. Here is the location (Google Maps Street View). We were actually a little disappointed when we toured the Château de Cheverny (hours and prices). We visited on our way home from scouting Chambord, because we’d read that there was a nice hedge maze. Unfortunately, the maze was closed for repairs after having been damaged by visitors. This was the smallest and least castle-like of the châteaux we visited, but I suppose it wasn’t without its charm. 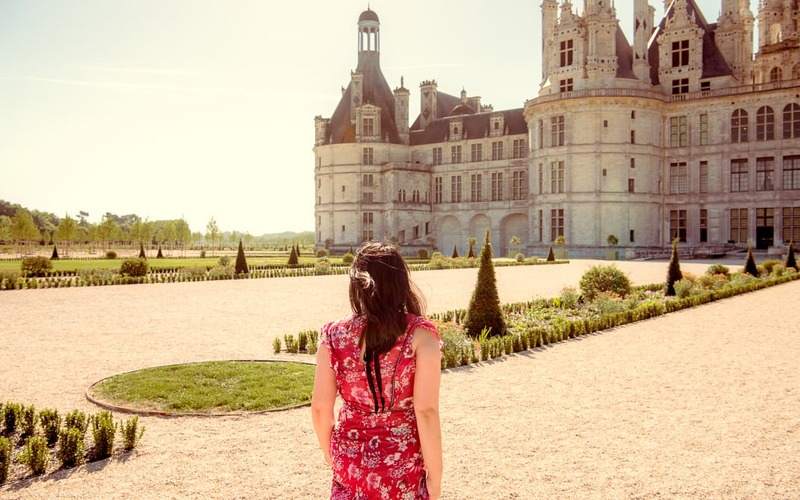 The Chateaux of the Loire Valley have some amazing gardens. 1: The Gardens and Moat: Though it is easy to get an unobstructed view of the building from the front, we thought the grounds in front of the building were very brown, and unequal to the beautiful architecture. The gardens behind the building, on the other hand, were lush and green, speckled with statues and fountains. 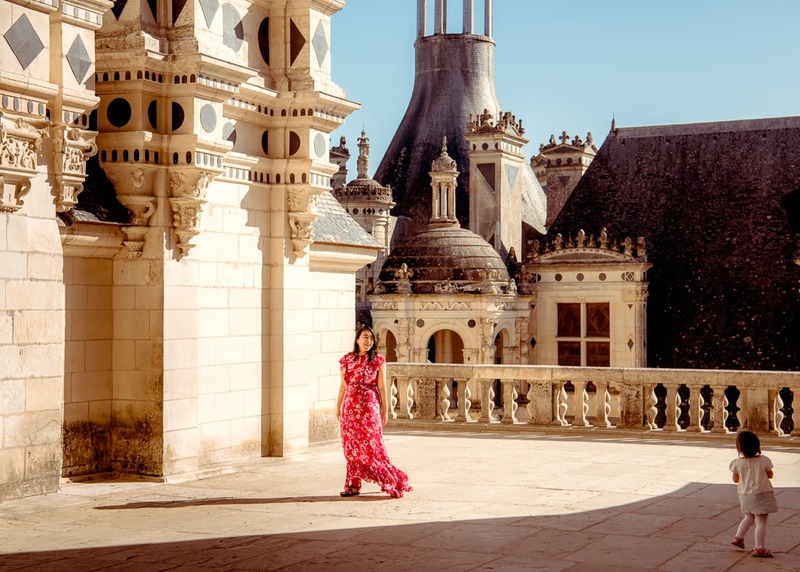 It was easy enough to compose shots with the château in the background while Dannie and Lisa chased each other around. As an added bonus, at the far end of the garden, there is a cafe that sells ice cream. 2: The Hedge Maze??? : I assume that they will reopen it eventually. I’d love to give some tips about photographing it, but I’ll leave it up to our readers to put it in the comments if they ever make it there. We also didn’t take any photos of the enormous kennels, mostly because it was getting pretty hot by midday, and the air conditioned car was calling to us. 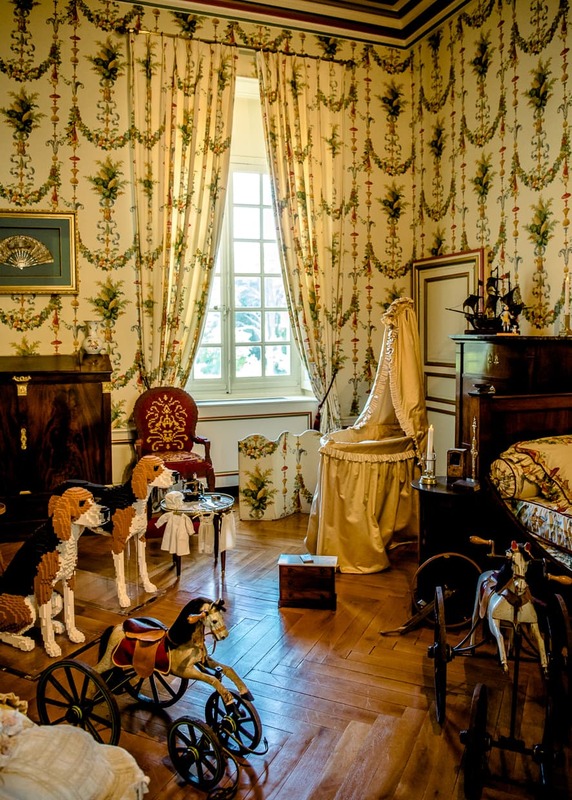 3: The Interior: Touring museums and castle interiors doesn’t tend to be very rewarding with a toddler in tow, but I had to admit that Cheverny had done a really nice job with their exhibits inside the château. Both wings of the building were fully restored and decorated, and they had done a nice job of making the place look lived in. One thing to note, I kind of got the feeling that place was sponsored by LEGO. The little plastic building blocks kept sneaking into the scenery (look carefully at those hounds), and in the aforementioned cafe in the garden, there was a big LEGO area for the kids to play in. Of course, not every outing has to be about photography, and Château de Cheverny does have other claims to fame. If you are a fan, you may be interested to know that the structure was the inspiration for the Château Moulinsart in the Tintin cartoons. There is an exhibit near the entrance celebrating the connection to the iconic character. 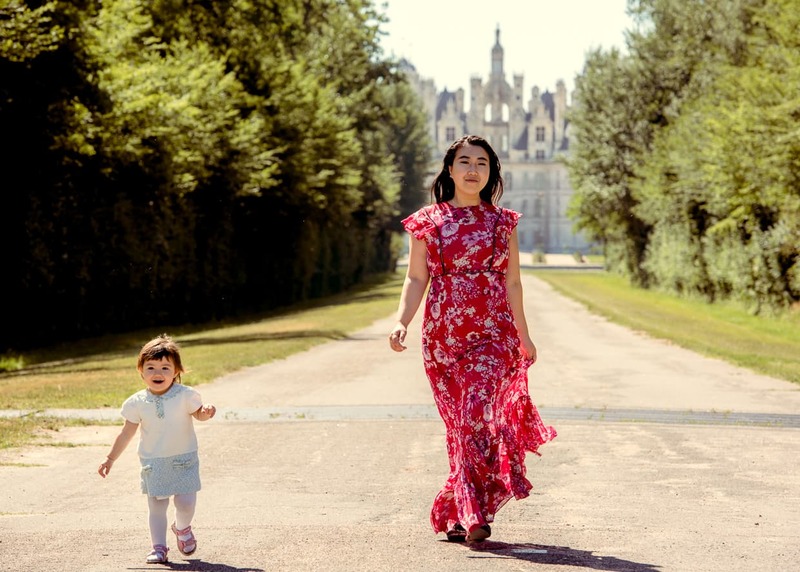 I’ll also say that of all the châteaux we visited, Cheverny had the most relaxing grounds. In addition to the manicured gardens, there were also big lawns with huge trees that provided some nice shade. If we lived nearby, we could have imagined visiting for picnics or just to let Lisa run around in a quiet, safe environment. 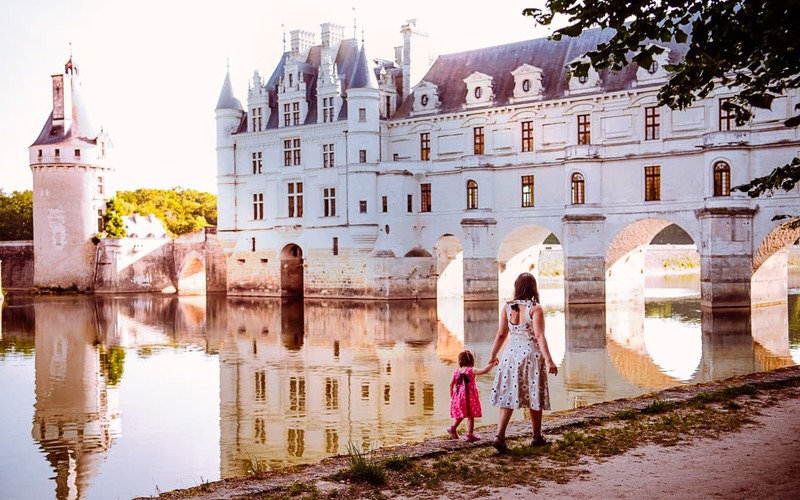 Before we learned its name, Dannie and I always called Chenonceau “that pretty bridge castle,” while we were planning our trip. 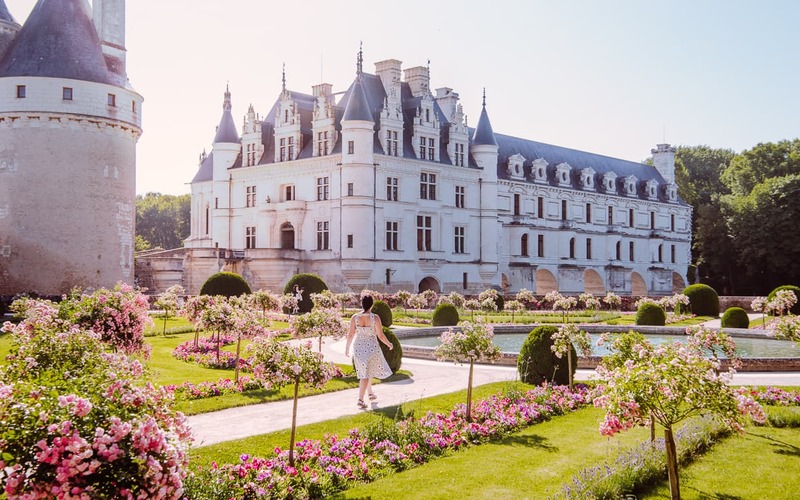 But despite our crude descriptions, Château de Chenonceau is actually one of the most elegant structures we have ever visited. 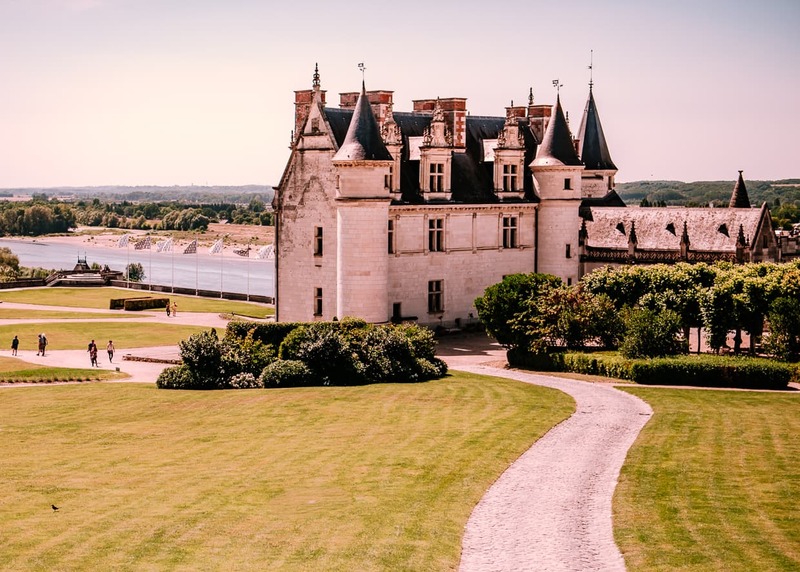 The main body of the Château is surrounded by flowering gardens and green trees, but it is best known for the expansion that straddles the River Cher, whose waters flow beneath white arches. 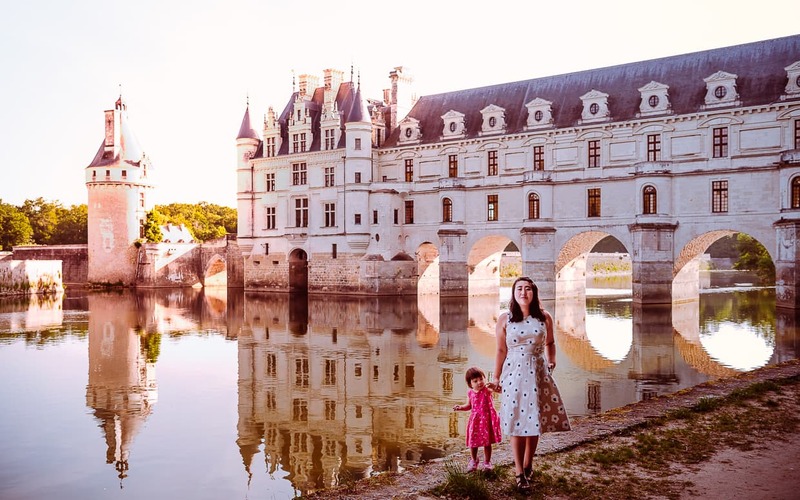 The River Cher flows through the Loire Valley, straight under the Chateau de Chenonceau. 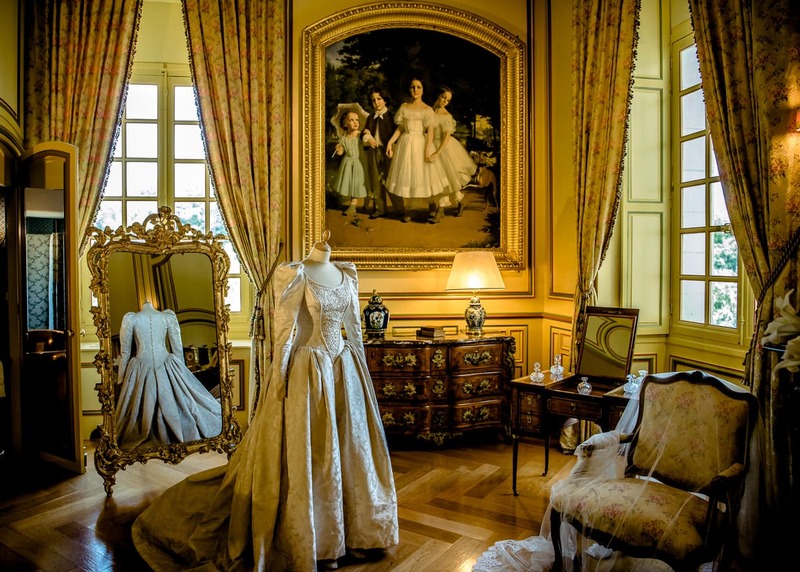 The history of the Château de Chenonceau is long and sad. Countless owners fell into debt expanding or maintaining it, and it passed from one owner to another over the centuries, its beautiful facade masking a long chain of grief and squandered fortunes. It sure looks nice in photos though! 1: In the Forest: After paying to pass through the gate (follow the link above for hours and prices), there are a couple of ways to approach the castle. One way is to walk through the vegetable and herb gardens on the right. But we preferred the long, tree-lined road that hugged the edge of a canal. The forest was so saturated with green, and the trees were so tall and straight that it really did feel like we ought to be on horseback or something. I decided to photograph Dannie and Lisa from across the canal to highlight the length of the road and the height of the trees. 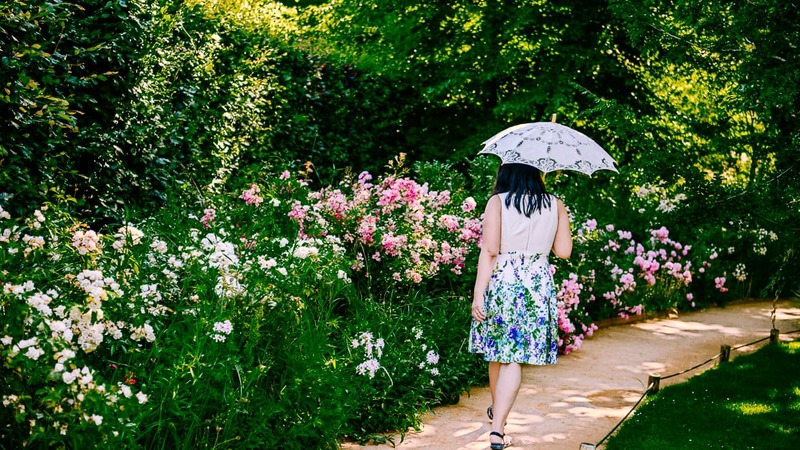 2: The Castle Gardens: Right outside the château, there are lovely gardens in which paths wind between trees and bushes that bristle with pink flowers. 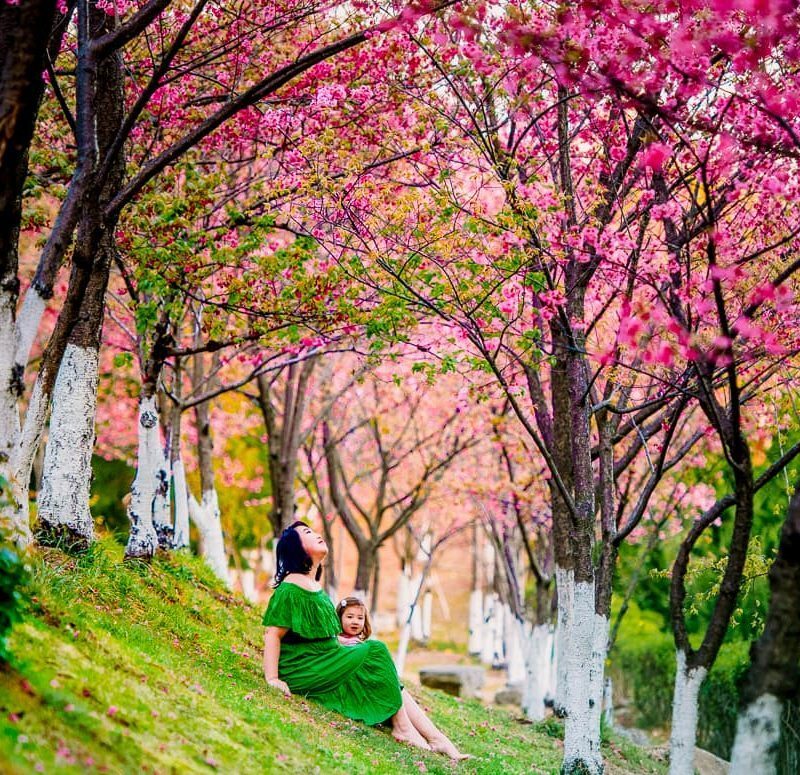 The flowering trees are just tall enough that you feel immersed in them as you wander, but just short enough that they never obstruct your view of the castle in the background. The stairs leading up to the door also provide a great angle for shooting down over the gardens. 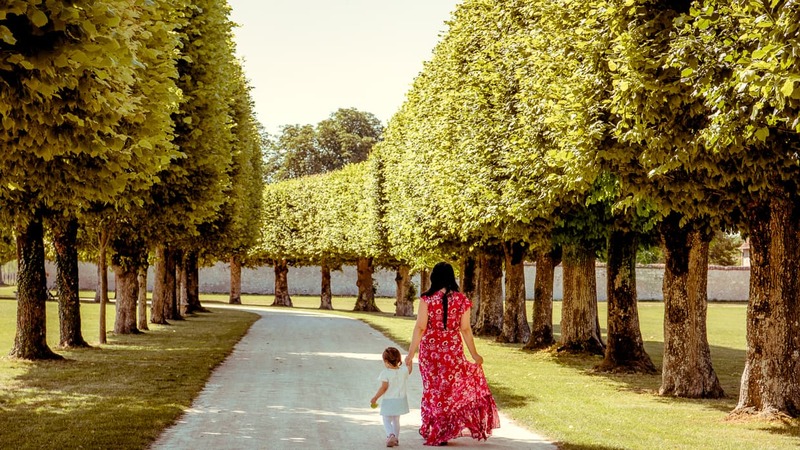 Dannie really liked the gardens in front of Chateau de Chenonceau. 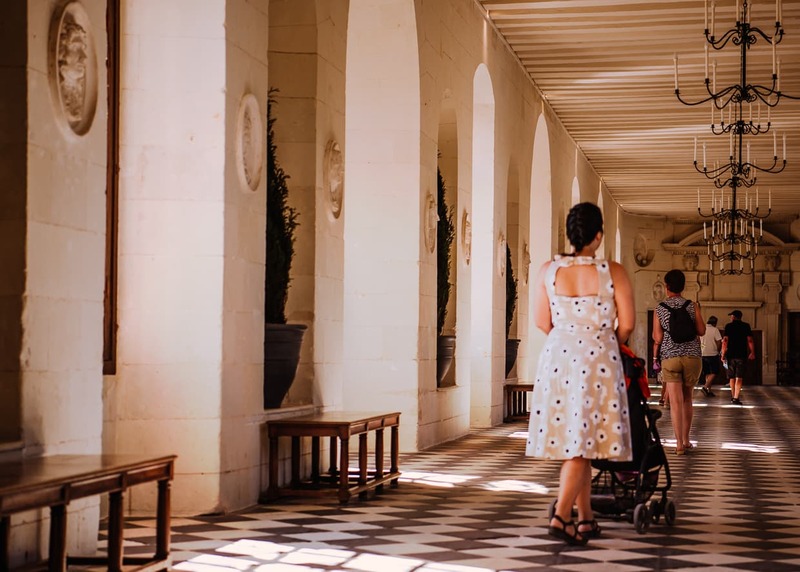 3: The Gallery: Don’t linger too long in the gardens though, because the Chenonceau gallery gets crowded quickly. We scouted the estate during the day and showed up early to photograph it the next day. 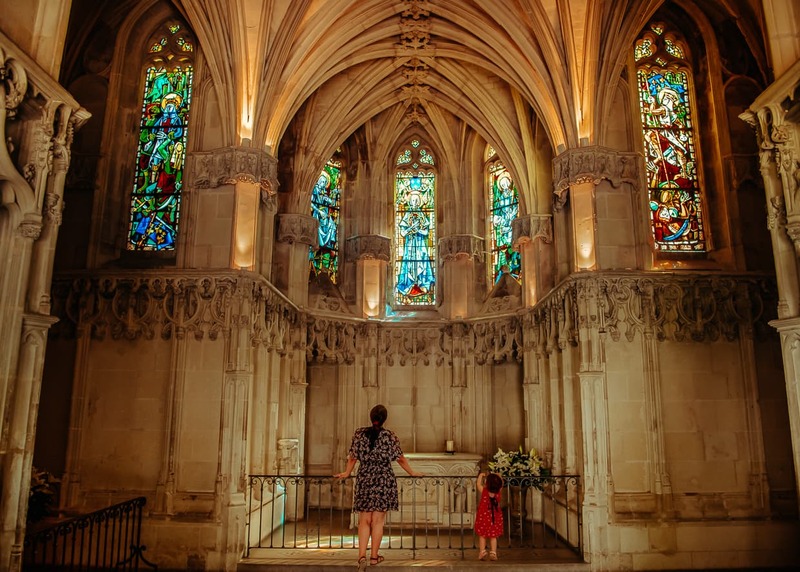 Unfortunately, before we could go in we had to clean up a carsick toddler, and by the time we got to the gallery it was tough to get a good shot of the beautiful walls and checkered floor. 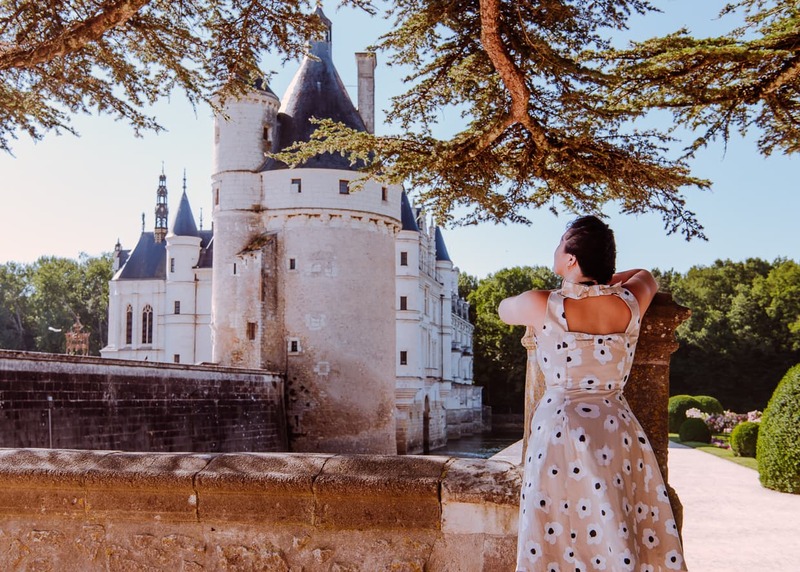 Bonus Angle: From across the River Cher: Even though the entry fee to Chenonceau will buy you a lot of great photos, the best angle of all is actually free. To get there, you have to drive down the road and across the river. Once there, you can park next to a bridge (Google Maps Street View) and walk along a trail next to the water until you come to the other side of the bridge expansion of the château. This angle is especially nice because you don’t have to worry about other tourists, and there are no opening hours to keep you away in the morning when the light is still nice. 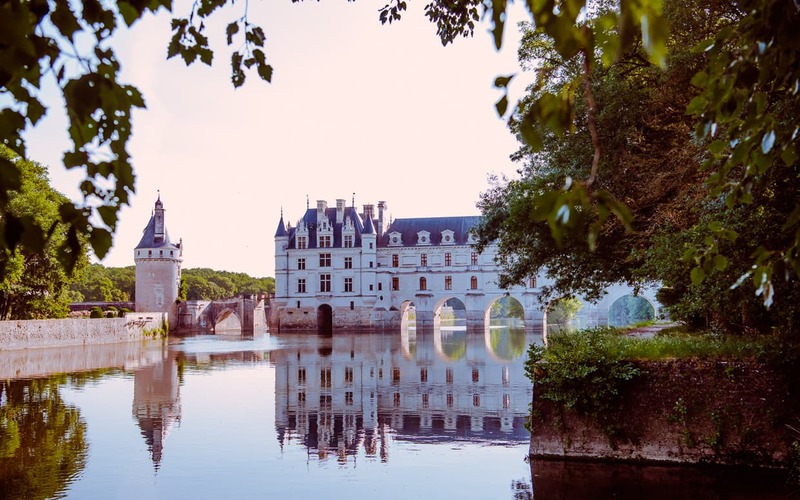 The Chateau de Chenonceau casts a nice reflection on the River Cher. 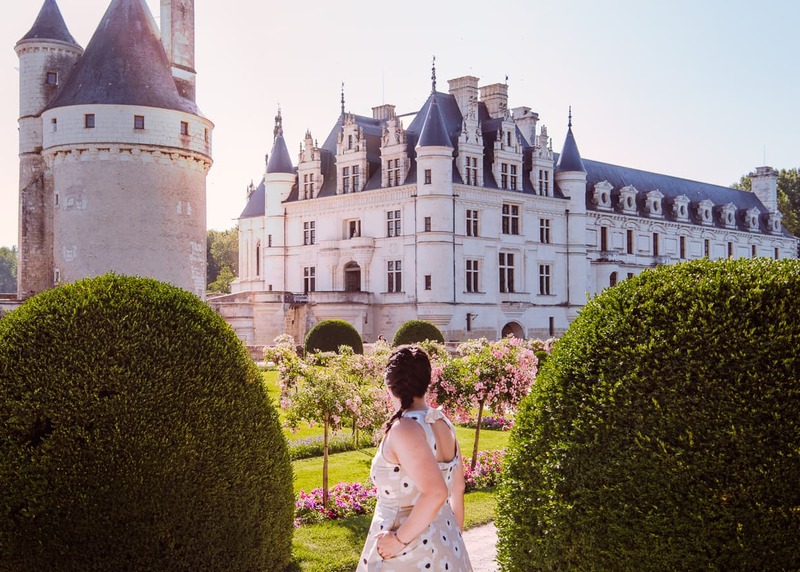 We felt pretty lucky that our visit to the Loire Valley happened to coincide with the annual International Garden Festival at the Château de Chaumont. 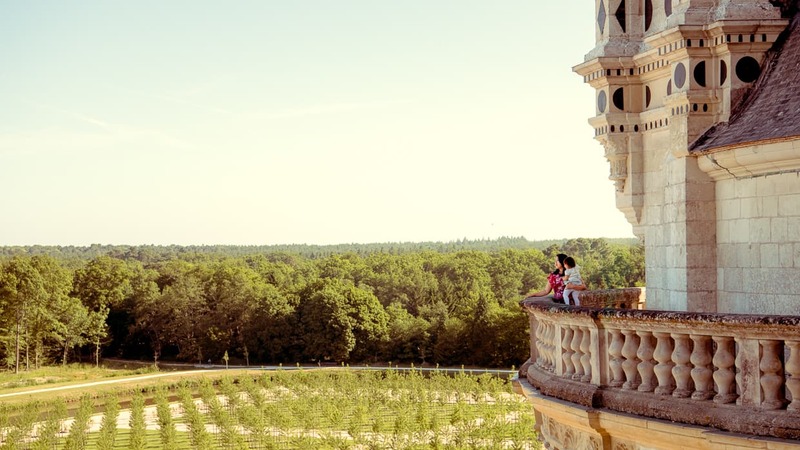 Dannie and I were still mostly interested in the fairytale castle towers of the château itself, but we certainly didn’t mind that an army of gardeners had conspired to put on a show for us. 1: The Reflective Pool: Just inside the gate, there is a pool of water surrounded by what I believe were once the stables. I don’t think the pool was intended to be a big attraction, but with the buildings sheltering the water from the wind, it’s a great place to photograph some reflections. 2: The Gardens by the Castle Entrance: The entrance to the château is tucked between two huge white towers with blue roofs. To the right hand side of the dirt road that approaches it, are gardens filled with various flowers that make a delightful foreground. Nearby, on the left, huge green tree branches hang down, rounding out the view. Bring your wide angle lens, because the castle is hard to fit in the frame once you get close. 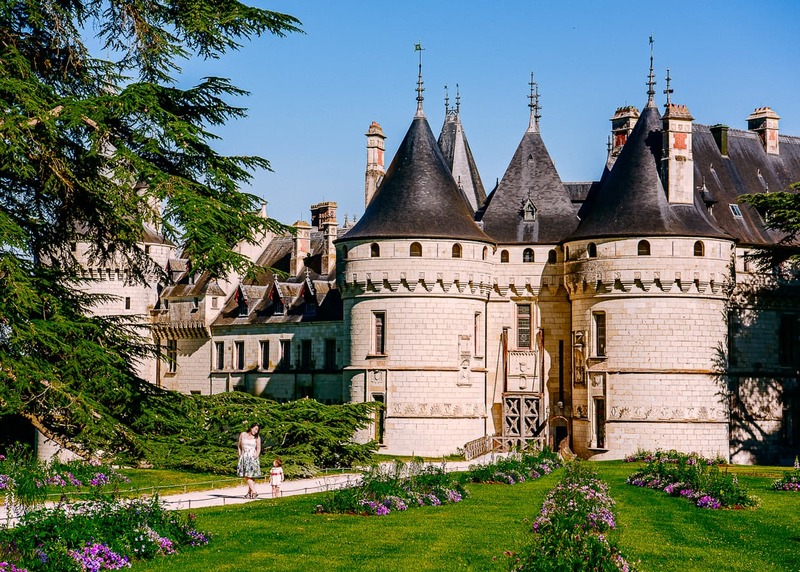 One of the most picturesque castles in the Loire Valley. 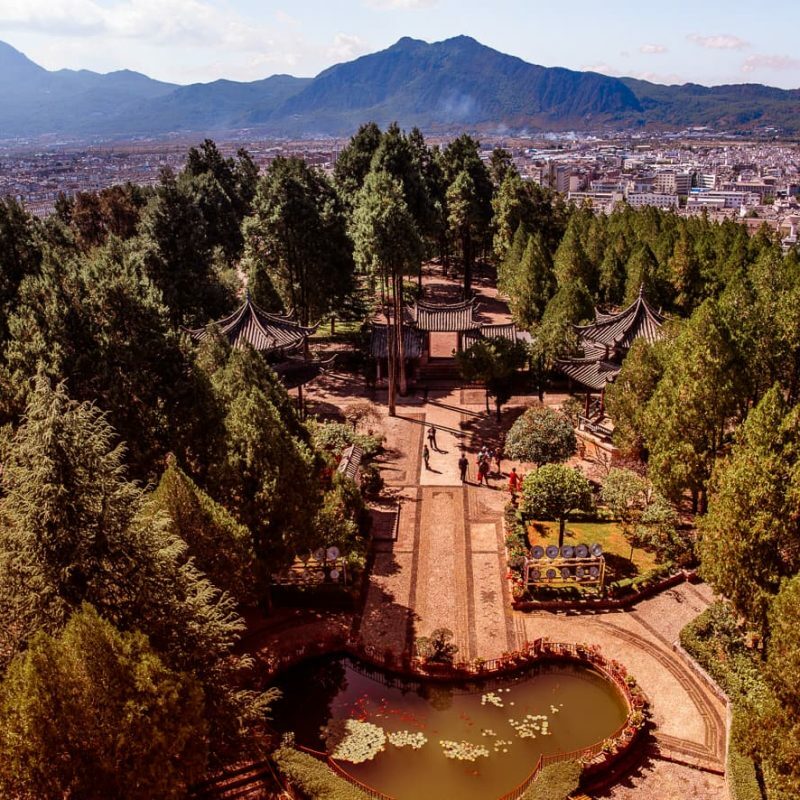 3: The International Garden Festival: During the Garden Festival, gardeners and artists create dozens of gardens around a central theme. When we were there in 2017, the theme was “Flower Power” which suited us just fine. There were many creative displays, and it was always delightful to look up from the blossoms and see the château rising up in the background. 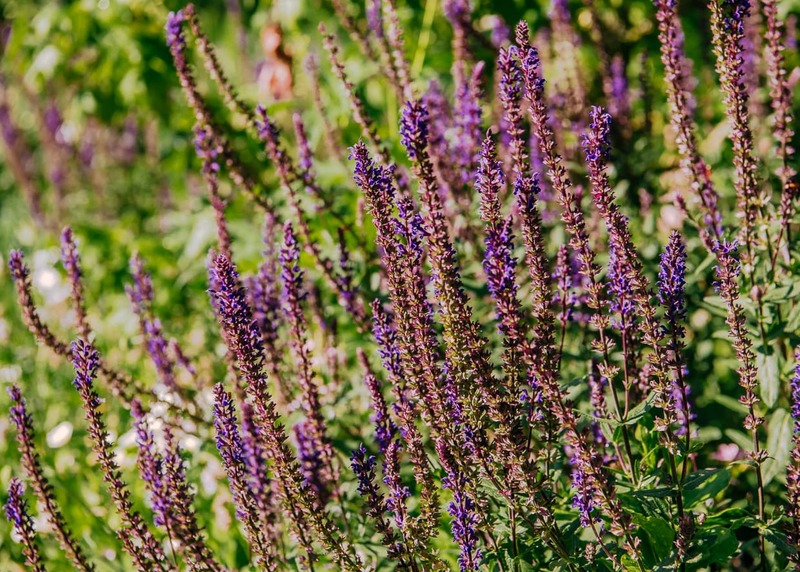 The International Garden Festival was an unexpected treat during our stay in the Loire Valley. Bonus Angle: On the Bridge Across the River: As we were driving to the estate from Amboise, I could see the Château Chaumont on the hillside on the opposite bank. The huge structure dwarfed the little white houses on the riverbank far below. I wanted a photo of that view with Dannie in the foreground, so I had her and Lisa walk out onto a bridge (Google Maps Street View), and I used a telephoto lens to compress the distance a little. Of course, since it was already blistering hot outside, I didn’t make her stay out there for long. 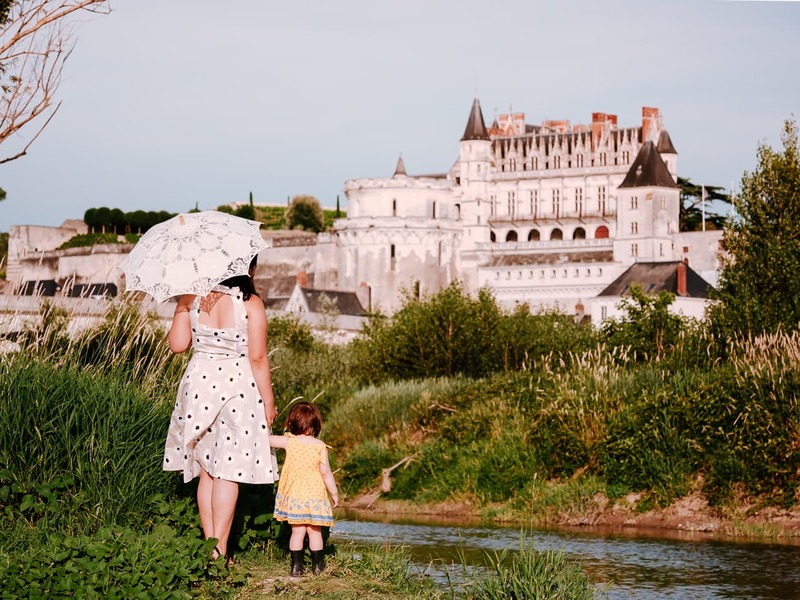 Because we made our Loire Valley home base in Amboise, the Château Royals d’Amboise was easily our most photographed Castle in France. 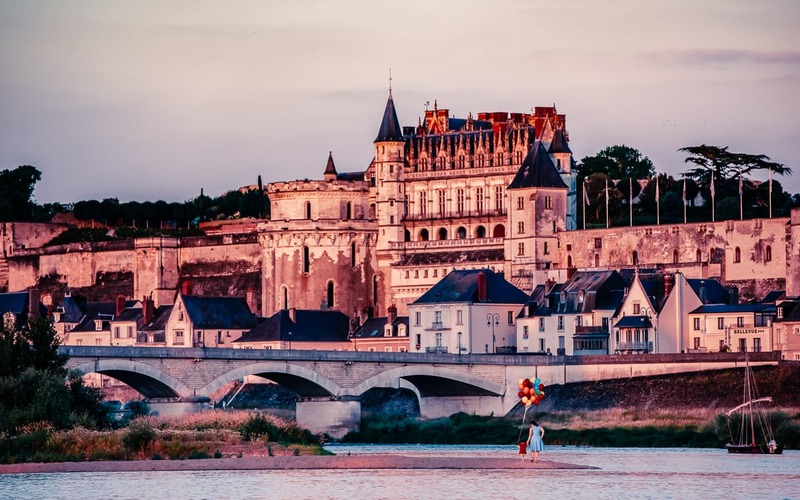 It was the home of King Charles VIII, and now it is the centerpiece of an otherwise understated town on the banks of the Loire. 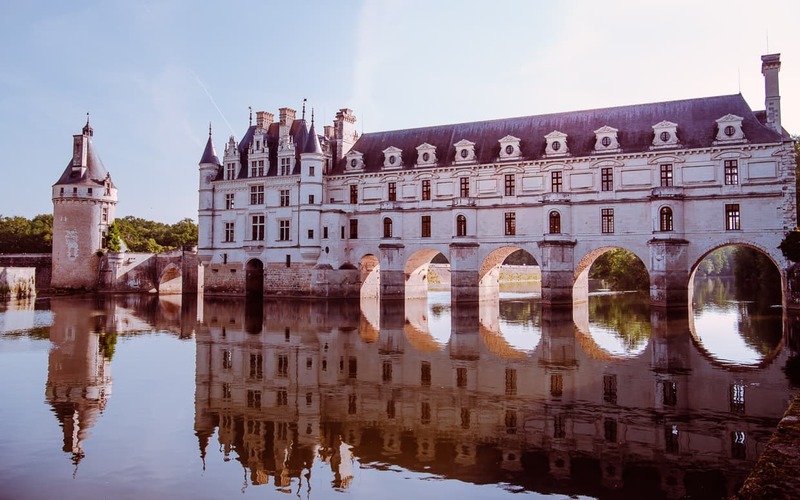 1: Ile d’Or: The Ile d’Or is a small island in the middle of the Loire River, and it is the midway point of a bridge that connects one bank to the other. 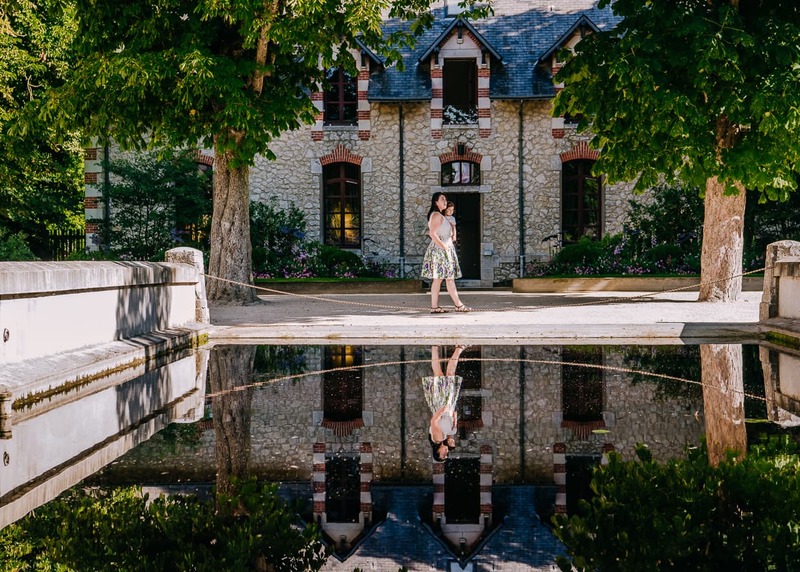 From the island you can easily position yourself directly across from the Château d’Amboise, and on a calm day you can even get a really nice reflection on the water. 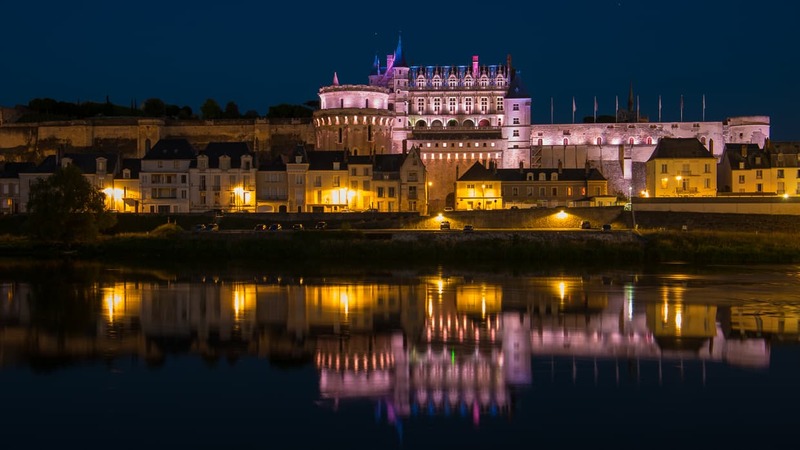 This is a great place to photograph the Chateau d’Amboise at Night. If you head to the southwest corner of the island, you can also find some sandbars and trees. From there you can get nice compositions of the castle with the bridge in the foreground. 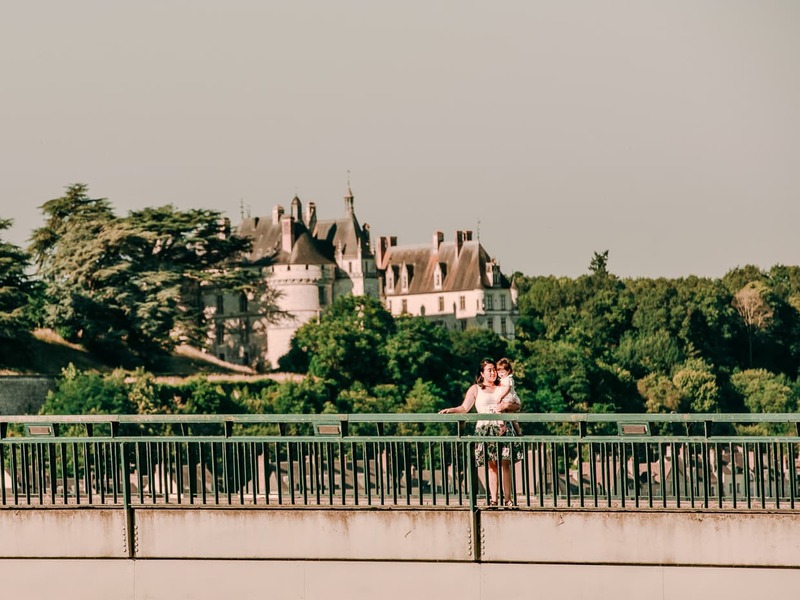 2: Across the Loire River: By following the bridge all the way across the Loire, then climbing down the embankment to the river bed, It is possible to capture some stunning views of the château and the bridge. For fun, Dannie and I bought dozens of colorful balloons and a helium tank, then let Lisa hold the balloons on the Ile d’Or between me and the castle. The Loire River certainly doesn’t want for scenery. Amboise was amazing. 3: The Castle Gardens: If you enter the castle grounds, you’ll find that there is a lot of open space since many of the buildings that once stood there have been demolished over the years. 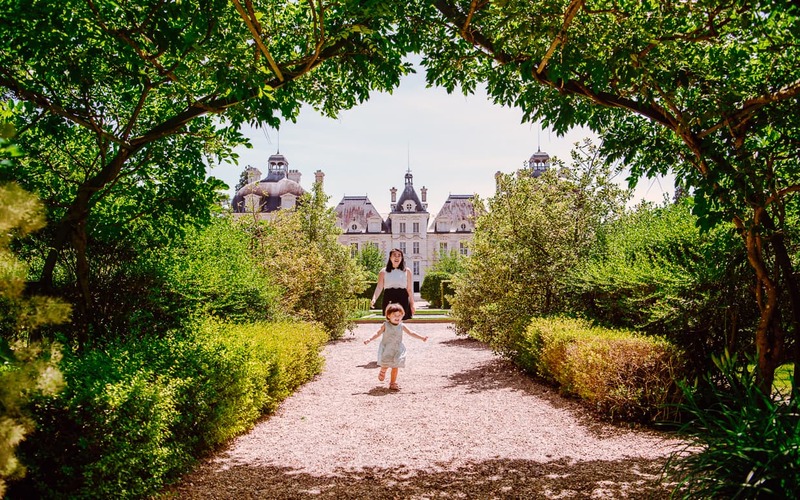 Luckily they were replaced with some small (by French Château standards) gardens that provide compelling foregrounds for your photos of the château. Note that from the side of the building near the entrance, the château doesn’t look very castle-like, but as you make your way around to the gardens, it really starts to look magical. 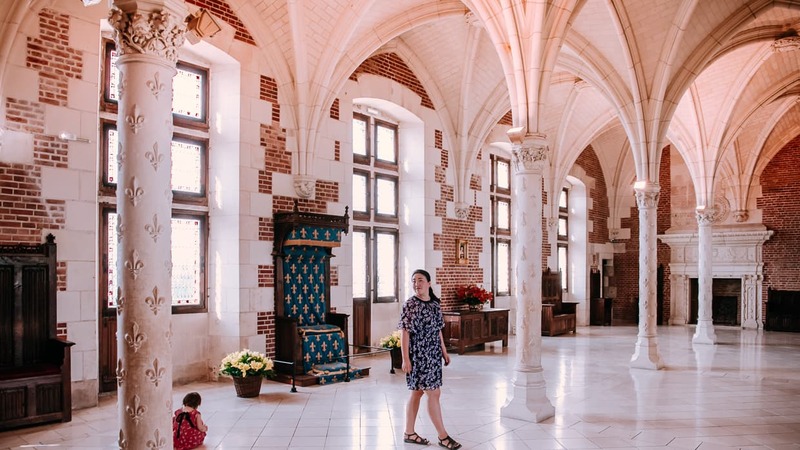 4: The Throne Room: I was underwhelmed by the interior of the Château d’Amboise, the one exception being the throne room. I loved the arches and columns and the tile floor, though in order to get a wide enough shot, I had to climb on a bench way over in the corner. Lisa thought this was hilarious. 5: The Chapelle Saint-Hubert: This small but ornate chapel sits well outside the château, right on the fortified wall that looms above the town of Amboise, France. The structure itself is nice, but I really loved the interior, where large stained glass windows showered light down on the floor. Bonus Angle: From Your Airbnb: Ok, this one only actually works if you stay in the same Airbnb we did. 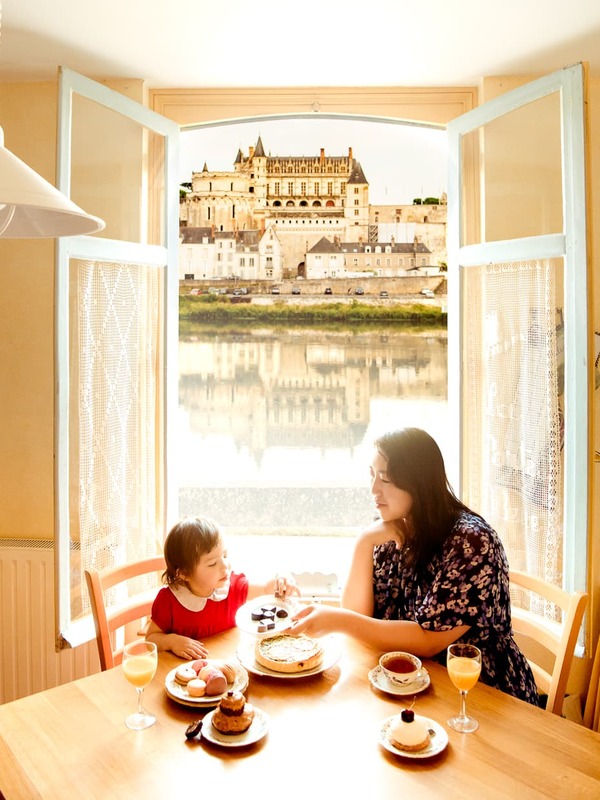 You can read about the apartment in our post about Amboise, and if you are looking to use airbnb for the first time use this link to save $40 (and earn us a commission at no extra cost). 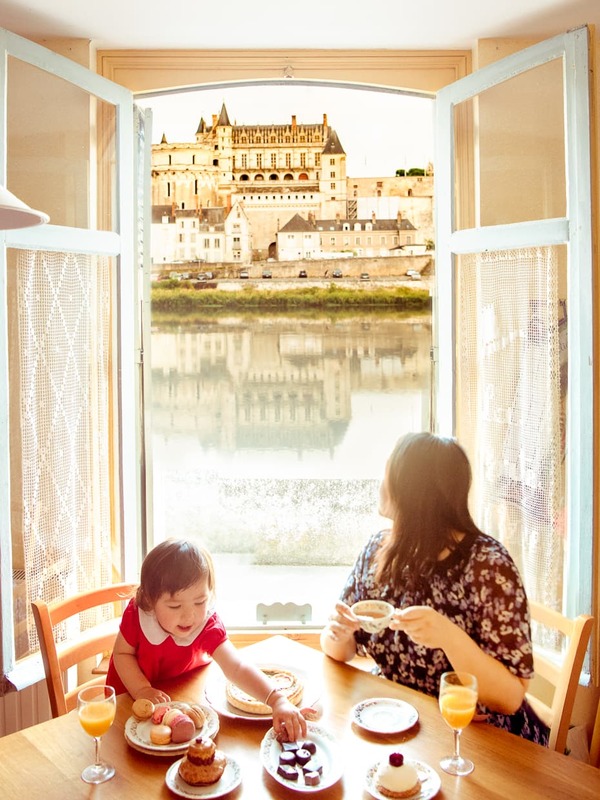 Our kitchen in Amboise had a stunning view of the château, and we spent every night sipping local wine and looking out the window, listening to the water flowing by. 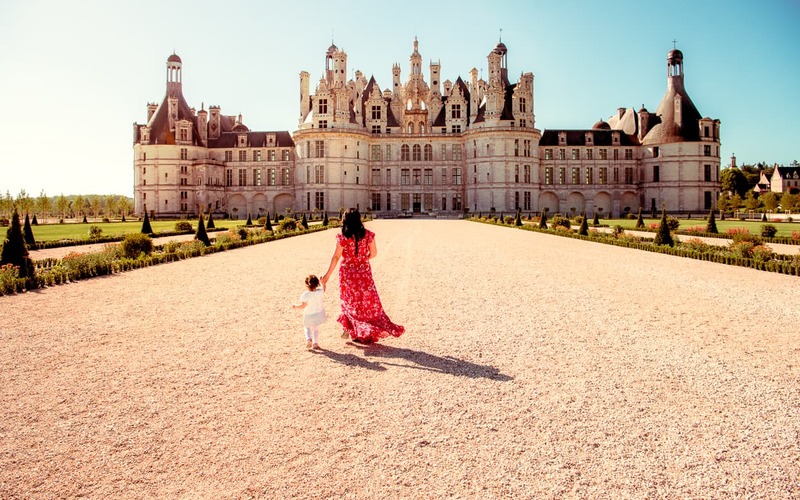 So those are our tips for photographing the Loire Valley Châteaux. 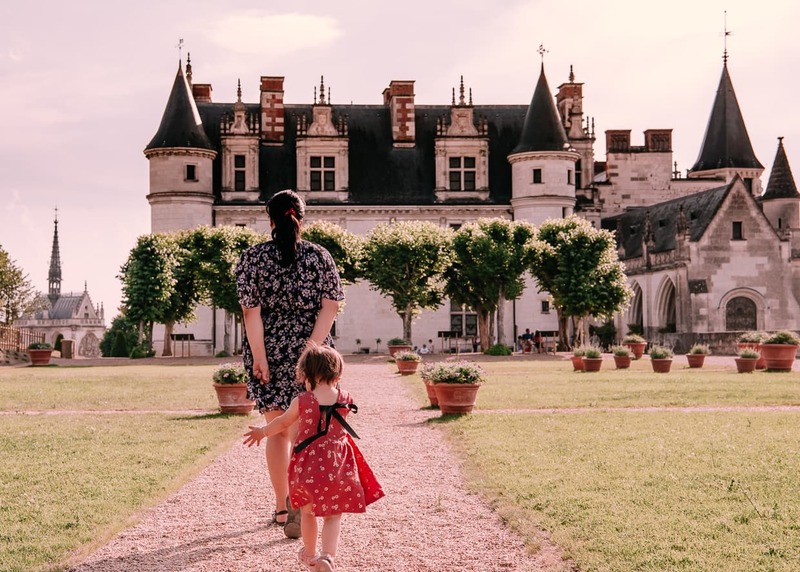 As we continue our travels, we really hope we make it back to France some day, and when we do, we’ll be sure to add a few more castles to the list. If you’d like to see photos of some of the other regions we’ve visited, check out our destinations page. And don’t forget to follow us on Instagram. 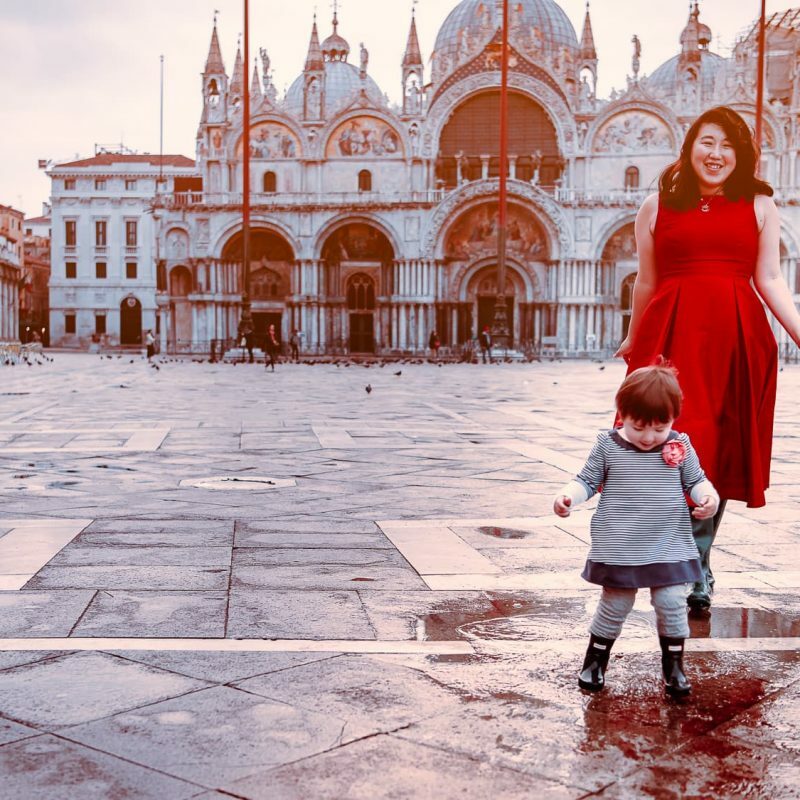 If you are curious about our efforts to monetize our blog and continue traveling indefinitely, check out my monthly report: Operation Digital Nomad. In the meantime, have fun exploring the Valley of Kings.